India and China are projecting their latest soft-power diplomacy as an enduring, not exploratory, exercise. Though challenges remain, this certainly augurs well for bilateral ties between two Asian superpowers, writes P S Suryanarayana. Buoyed by four summit meetings and the formation of a new people-to-people mechanism in quick succession, China–India engagement appears to be on an upward trajectory. Though challenges remain, it is an opportune moment for the two countries to press ahead towards total rapprochement. Chinese President Xi Jinping and Indian Prime Minister Narendra Modi met four times, informally on the first occasion and formally thereafter, over just eight months in 2018. 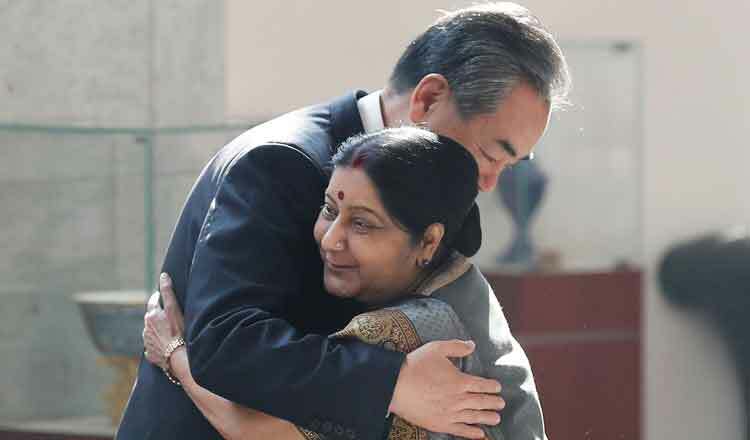 In a follow-up move in December 2018, Indian and Chinese foreign ministers set up a “high-level mechanism” for people-to-people and cultural exchanges. China and India see this soft-power mechanism as a potential “social foundation” for bilateral relations. Greater dialogue between media outlets, the acceleration of tourist flows and collaborations between museums are envisioned. An agreement has also been reached for co-production of films and other forms of entertainment. Potential new avenues of cooperation include popularisation of Chinese language and martial art forms in India, and of Indian languages and yoga in China. The first Xi–Modi meeting of 2018 at Wuhan, China in April was a rare one-on-one informal summit. It helped the two countries overcome the bitterness of their prolonged military standoff at Doklam in 2017. It was decided that a second China–India informal summit would be held in 2019. The second Xi–Modi meeting of 2018 in Qingdao, China in June coincided with India’s admission to the Shanghai Cooperation Organisation after China acquiesced in Russia’s proposal to invite India. This was followed by a third meeting on the sidelines of July’s BRICS summit in South Africa and another during November’s G20 summit in Argentina. The Xi–Modi informal summit facilitated a flurry of bilateral discussion at political and official levels. The 21st round of talks between Special Representatives on the border dispute was held in late November. Chinese and Indian defence ministers met in August, and in December the two armies resumed a joint exercise. Mr Xi’s and Mr Modi’s diplomacy appear to converge on the basis of their current strategic considerations. China’s increasingly challenging interactions with the United States offer Mr Xi an opportunity to seek better engagement with India. His key objective is to ensure that New Delhi does not make common cause with Washington against Beijing. For Mr Modi, too, the same China–US tensions provide a different kind of opportunity to capitalise on China’s and perhaps also the Trump administration’s overtures to India. While India and China have agreed to build a ‘social foundation’ for bilateral engagement, the outcome in this limited sphere will depend on the relative attractiveness of their respective soft-power skills. India prides itself on its rich variety, ranging from yoga and the fine arts to modern cinema and computer science. China, too, emphasises its uniqueness in such areas as Confucian culture, sciences and the pedigree of the Chinese language. Both need to avoid the counter-productive calculation about which country’s soft power is more potent as a diplomatic tool. The central practical challenge, as opposed to a strategic one, is how much time and space Beijing and New Delhi can find to move towards total rapprochement as Mr Xi concentrates on piloting China’s rise as a global superpower. In the near term, a reset of China–US relations (if it does happen) and the political complexion of India’s next government will be critical to the prospects of New Delhi–Beijing engagement. Another issue in the near term is that India’s erstwhile partnership with China on issues of global commons, such as climate change and world trade, may prove more elusive now. The international community is gradually veering towards the view that China, unlike India, is a developed country for all practical purposes in regard to these two issues. For the longer term, China and India must settle not only their boundary dispute but also their huge bilateral trade imbalance. And they must avoid a potential cross-border dispute over the shared waters of the Brahmaputra (Yarlung Tsangpo) river. How can such stability be brought about? Many see the huge trust deficit in the relations between India and China, fuelled by history and their 1962 border war, as the real stumbling block. To move forward, at least three steps are needed. Besides sustaining soft-power diplomacy, both countries must meticulously implement their current confidence-building measures and engage in purposeful exercises and candid dialogue in the military domain. India and China are projecting their latest soft-power diplomacy as an enduring, not exploratory, exercise. Yet contrary to an agreement in 2015, China and India are yet to open consulates in Chennai and Chengdu that would facilitate people-to-people links. In a separate development, Beijing opposed Mr Modi’s visit to Arunachal Pradesh on February 9, saying that China “never recognized” the area as India’s. New Delhi promptly responded that China was informed on “several occasions” that “Arunachal Pradesh is an integral and inalienable part of India”. These two cases are indicative of the persistent challenges in China–India diplomacy, both soft- and hard-power. Only by addressing the challenges can China and India hope to strike a positive modus vivendi.